The deal was signed with the Shine Group which is run by Elizabeth Murdoch - daughter of Rupert Murdoch who owns MySpace parent News International. "MySpace is essentially the world's largest focus group," said Travis Katz, head of MySpace's international arm, announcing the deal at the MipTV-Milia conference in Cannes. "You can see what resonates with people and then take that content and blow it out worldwide," he added. Mr Katz said MySpace was developing local versions of its existing programmes plus original content in the 26 countries in which it operated and added that the company was discussing with hundreds of others about deals on its shows. 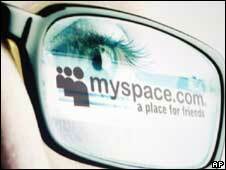 The deal marks a fresh attempt by MySpace to find an audience for its programmes beyond the internet. US network NBC broadcast MySpace's "Quarterlife" in February but viewing figures suggest it ranked dead last among all shows aired in that time slot. Many media companies have tried, and failed, to use the web as a testing ground for new shows, Forrester Research analyst James McQuivey told the Reuters news agency. "It hasn't produced bankable shows outside of the internet, or even on the internet," he said. "If you look at it (Web shows), there's a good reason why -- it's mostly bad." The MySpaceTV deal comes only days after the social networking site announced a partnership with three record labels to create an online music store. MySpace Music will be launched in conjunction with Universal, Sony BMG and Warner.